River Way Ranch Camp operates on 75 acres at Wonder Valley Ranch Resort located in the foothills of the Sequoia/Kings Canyon National Park. 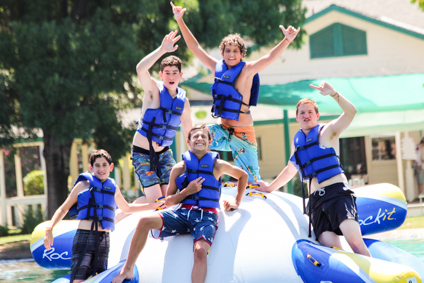 Camper cabins are air conditioned, resort style rooms equipped with bunk beds and bathrooms. Campers are typically bunked eight campers and two counselors to a cabin. In 2013 we added an 11,000 square foot dormitory with 12 rooms, 2 suites, built in bunk beds, and indoor bath facilities. This new building can accommodate up to 120 campers. Set against the backdrop of the foothills, River Way is landscaped with manicured grounds and paved walkways. The two acre man-made “What Lake” is the center of camp and home to our Atlantis, Blob, Paddle Boarding, Rockit, fishing, swimming, canoes, and kayaks. 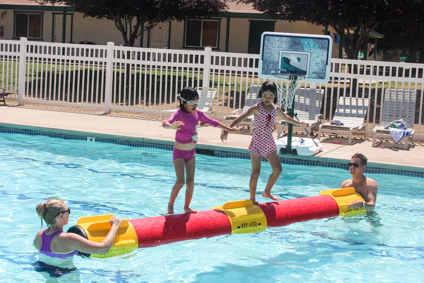 We also have an aquatic center, complete with four waterslides, and another pool for just leisurely fun and swim lessons.